World Streets: The Politics of Transport in Cities: Public Bikes: "Cycling on the rise"
When the Spicycles project was launched in 2006, cycling was not the "hot" mode of transport that it has become today. As project partners, we wanted to gather experience related to specific areas of cycling policy. We were keen to explore how key elements such as communication and awareness raising, and the building of local partnerships, might increase the modal share of cycling. 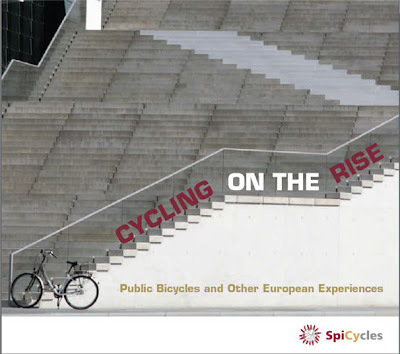 We had big expectations at the beginning of the project regarding cycling planning, but could not have predicted the explosion in the popularity of public bicycle systems that has taken place during Spicycles. All Spicycles' results can now be seen in the reports and newsletters on the website http://spicycles.velo.info, which also features an innovative interactive map for cycling planning, a benchmarking tool and a pool of consultants.